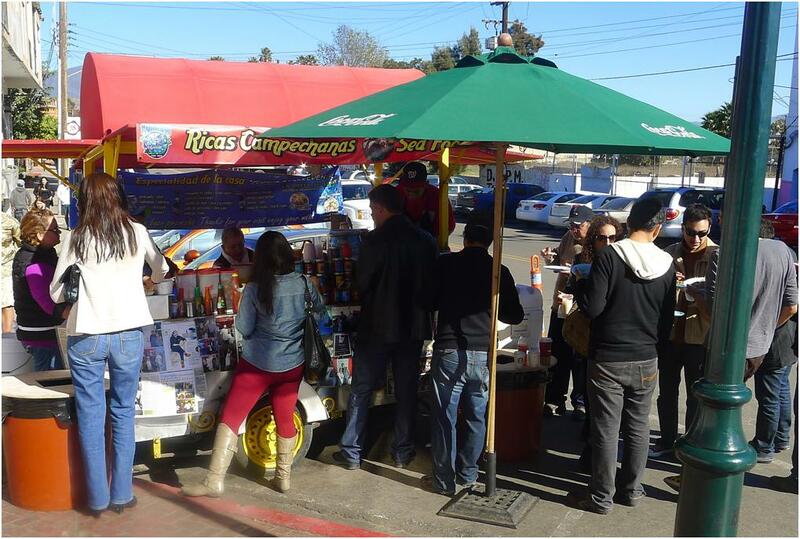 Mariscos La Guerrerense is what the most talented roadside Mariscos stand might be — could be — if only it dreamed big. Where El Huittusi in San Felipe (http://sdfoodtravel.com/san-felipe-restaurant-review-mariscos-el-huittusi/) might be the one with the picture next to the dictionary definition, Ensenada’s La Guerrerense is something different altogether. 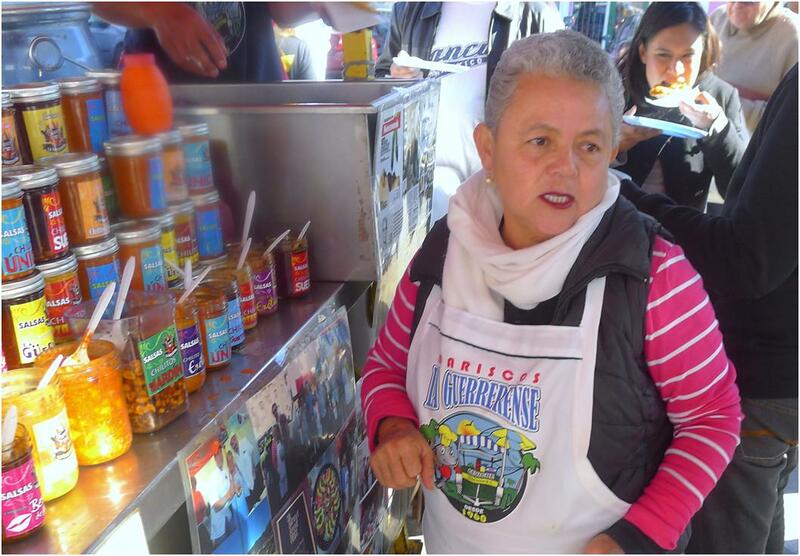 Rather than “merely” perfecting a culinary cliché — doing one thing and doing it very well – La Guerrerense’s Doña Sabina Bandera Gonzalez has elevated the conception of what a streetside food cart can be. Now, I cannot claim pride of discovery in La Guerrerense (which translates into English as a woman who is from the State of Guerrero). Tony Bourdain was there (“the best street cart in the world” and “Le Bernardin quality seafood in the street”), so was Rick Bayless (“one of the best places to eat in Mexico”) as well as a host of other television hosts, food bloggers and writers. All say – and correctly so – that the seafood at Mariscos La Guerrerense is as fresh as it can be. But that is, in a sense, almost a slight. 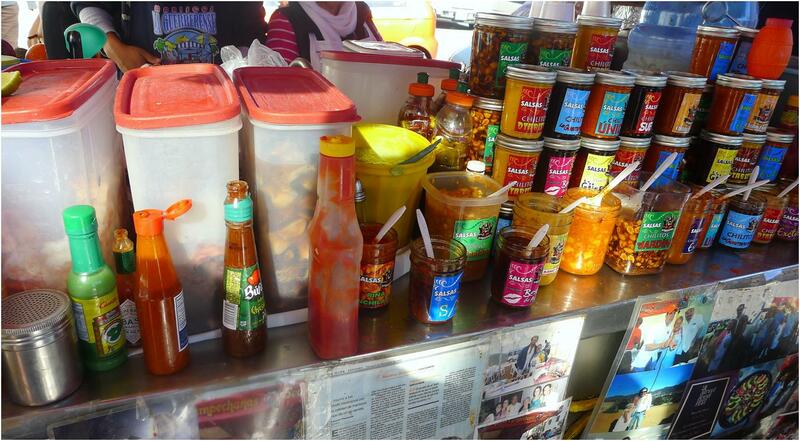 The stand is, after all, only two or three blocks from Ensenada’s Mercado de Mariscos, one of the best fish markets on the West Coast. The freshness of the seafood at Mariscos La Guererense is thus, essentially a necessary but not sufficient feature. The salsa bar – while something exceptional in its own right – is also not what makes the place truly special. Rather, what sets Mariscos La Guerrerense apart is the way that Sabina Bandera puts it all together: the artistry. There are many dishes on offer at the stand: mixed seafood platters, bacalao, sea snails, shrimp, mussels, octopus, classic ceviches and more. 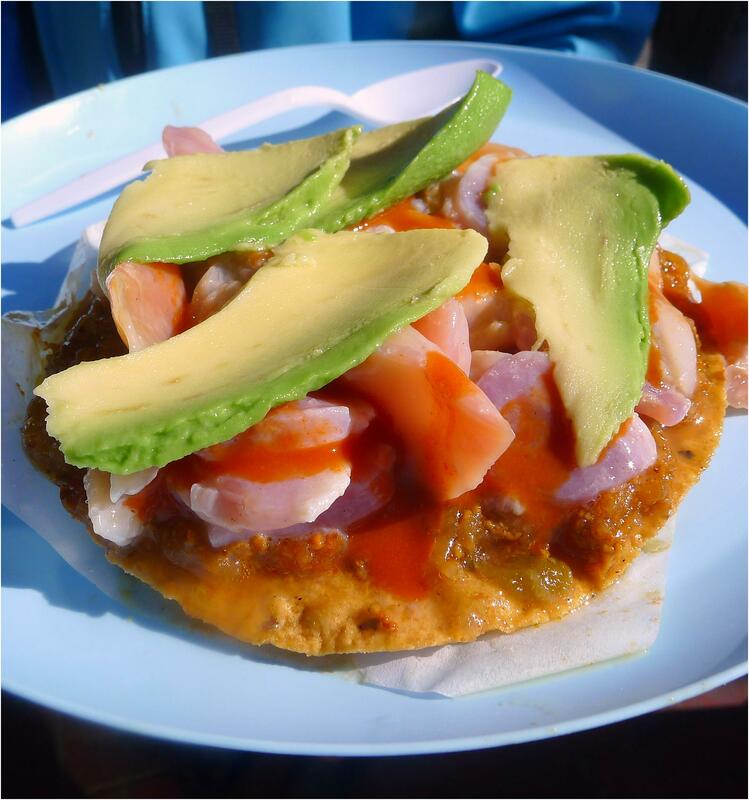 But the specialty is the Tostada de Erizo con Almeja: Sea Urchin (uni) and Pismo Clam Tostadas with a squeeze of lime, some hot sauce and garnish of avocado. It is a thing of beauty and thoroughly unlike anything I’ve ever tasted before. The uni paste on the bottom of the tostada provides a tier of flavor that is profoundly savory with more than a hint of sweetness and deep umami warmth. The pismo clams in the next layer up offer an intriguing and implausible textural contrast: simultaneously tender, toothsome and even the hint of a suggestion of a crunch. A squeeze of lime, a few dashes of hot sauce and some thin slices of avocado at that perfect point of sweet buttery ripeness complete the dish. It is, like so many great dishes anywhere, simultaneously both simple and complex. The artistry lies in the layering and sequencing of flavors and textures. For my part I decided to run the risk of gilding the lily by wandering over to the salsa bar. The winner for pairing with the Tostadas de Erizo con Almeja was a dark, almost burnt chile de arbol oil that was fiery but added an intriguing depth to a dish that was already impossibly deep. It is no exaggeration to say that Mariscos La Guerrerense is, in and of itself, quite worth a drive to Ensenada (and the time waiting at the border to come back). 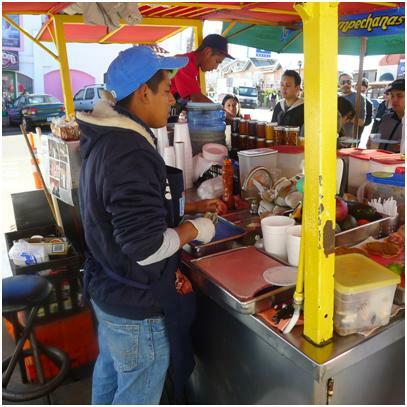 It is a food cart like no other, fueled by a culinary imagination that is improbable, at best. Great write up. Going to be in LA in a month and thinking about taking a drive down south to experience this place. Was it easy to get to? Safe travels? What’s the best way for out of towners to get there? Thanks for the info. Its actually quite easy to get there. Just drive South through San Diego and across the border. Follow the signs to Ensenada (taking the highway). We had no problems whatsoever. 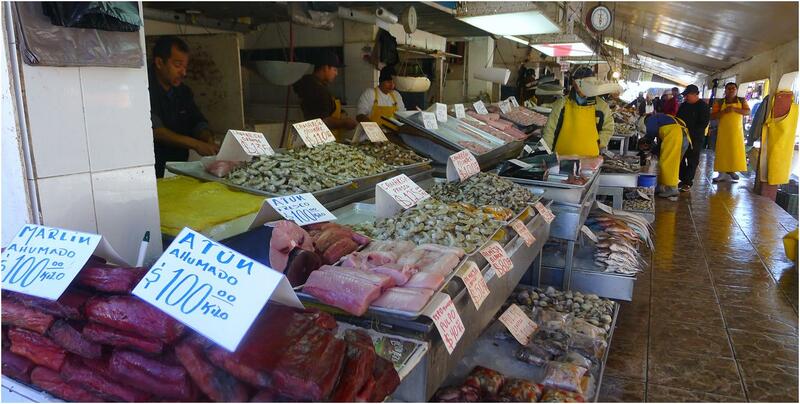 Once you get into Ensenada look for the fish market (“Mercado de Mariscos”) a block to your right…go two or so more blocks and it will be there on your left. Its best to park where you can and walk. and don’t forget your passport.